The last time a horse won the Triple Crown was in 1978. Here, Jockey Steve Cauthen rides Affirmed #3 as Jorge Velasquez tries to pull Alydar #2 into first place during the Belmont Stakes on June 10, 1978. Affirmed went on to win the Triple Crown. The owner of California Chrome, which failed in his Triple Crown quest Saturday at the Belmont Stakes, had some controversial things to say about how it’s “not fair” that a lot of Chrome’s Belmont competitors didn’t run in the Kentucky Derby and/or the Preakness Stakes. But California Chrome’s loss should surprise no one. This is the new normal. California Chrome is now the 13th horse to have won the first two races but failed to win the Belmont since Affirmed won the Triple Crown in 1978. Of the 13, one was scratched the day of the race, and eight lost to horses that didn’t even run in the Preakness. Having a number of “fresh” horses in the Belmont field was common in the era leading up to Affirmed’s Triple Crown, though perhaps a little less so. But the extent that these horses have been dominating in the Belmont is just one aspect of a bigger issue. Of the 23 horses that won the Preakness and not the Derby since 1979, just five won the Belmont (the last to do so was Afleet Alex in 2005). And of the 23 that won the Derby but not the Preakness, just two won the Belmont: Swale in 1984 and Thunder Gulch in 1995. In total, 59 horses have won either the Derby or the Preakness or both since 1979, and of those, just seven have won the Belmont. The main thing that separates the Belmont from the other two races is its length: At 1.5 miles (or 2.4 kilometers, or 12 furlongs), it’s over a quarter-mile longer than either the Derby or the Preakness. This distance has become increasingly rare in American horse-racing over time, to the point where almost all horses entering the Belmont these days have never raced it. Even highly experienced trainers may not have much experience with it. One trainer has come across Belmont’s extra distance only one in every 1,000 races. Belmont is billed as the “Test of the Champion” — kind of like a final exam for a horse to prove itself the most worthy — but in reality it’s more like a test of a deliberately different skill set: i.e., 1.5 miles is to 1.25 miles as the SAT Math section is to the SAT Verbal. The Triple Crown races weren’t always different types of tests. In the late 1800s, all three were 1.5 miles. The Derby switched to 1.25 miles in 1896, while the Preakness experimented with a number of different lengths between 1894 and 1923 before settling on 1.1875 miles (or 9.5 furlongs) in 1924. The Belmont was actually the first to abandon the longer distance, switching to 1.25 miles in 1890, but it switched back for good in 1926. For at least a half-century after the distances were settled, the three legs of the Triple Crown seemed about equally likely to be won by a horse that would (or did) win one of the others. But since 1979, the short track/long track divide has become huge, and the 13 failed Triple Crown attempts are just part of the story. Between 1926 and 1978, of the 20 horses that won the Derby and Preakness, 10 of them won the Belmont — since 1979 those horses are zero for 13. Between 1926 and 1978, 33 Belmont Stakes included no horse that won both precursors, and of those 33 races, 14 were won by a horse that had won one of the prior Crown races (21 percent of the 66 such horses). Since 1979, there have been 23 years where no horse won both precursors, and just seven Belmonts were won by a horse that had won one precursor (15 percent of 46 such horses). As you can see, the odds drop significantly for horses with one win on the shorter tracks going in, and completely for horses with two wins. As a natural result, the odds of winning the Belmont for a horse with zero wins in the previous two races have grown — to the point where they may (amazingly) even be higher than for a horse with a winning track record. 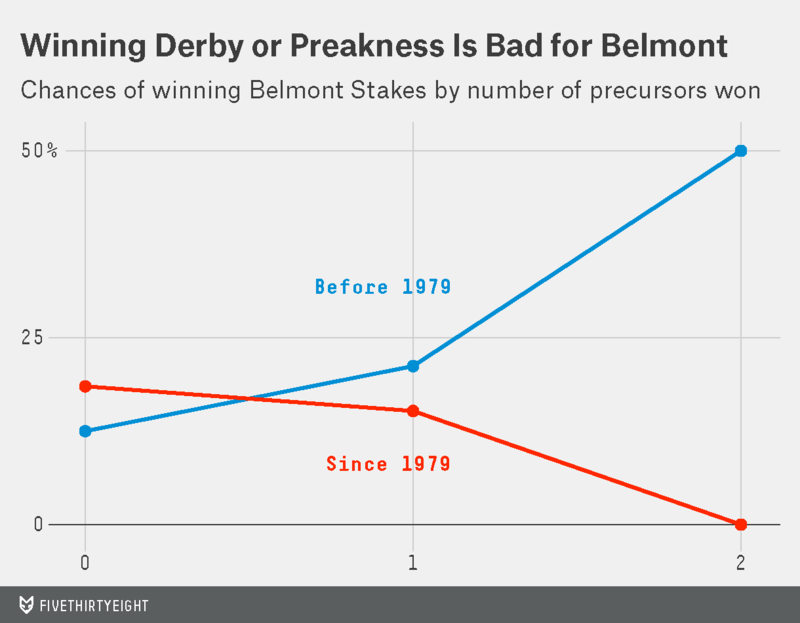 Thus, each marginal precursor win has actually decreased a horse’s chances of winning the Belmont (note that racebooks have completely failed to capture this effect). Perhaps this is partly because winning precursor races places horses at a disadvantage to fresher horses (as California Chrome’s co-owner Steve Coburn seems to think). But, more importantly, winning the shorter precursors is further evidence that a horse is more calibrated to the shorter distance. That top horses are calibrated to shorter distances is also evidenced by the rate at which Derby and Preakness winners match each other: California Chrome was the ninth such horse in the past 18 years. This is how it is now: More Triple Crown attempts, fewer Triple Crowns. Get used to it.